Great Internet Marketing Software Without The Ridiculous Price Tags - It's Time To Put Your Online Income On Overdrive! Internet marketing or SEO tools don't have to be expensive. In fact, on this page you'll be able to instantly download five awesome tools that will change your life forever, and all you need to invest is a measly $7. check Export your results to an excel sheet for deeper analysis. Man this is a great tool! I've always been trying to create professional "cloaked" affiliate links and almost every other software out there costs an arm and leg. With Affiliate Warrior I can do exactly what all the other top affiliates are doing, and I've already seen my commissions double in the past week! Freaking awesome - that's all I can say. I would have been severely frustrated with forum marketing if not for this awesome tool you call "Forum Warrior". I love the fact that it's an all-in-one forum "organizer" and posting system. Great work! 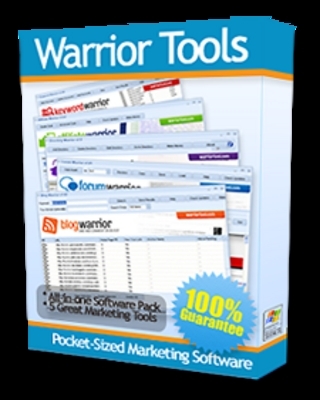 Get Master Resell Rights + Giveaway Rights To These Software Worth $67 for FREE! box And to make this even more irresistible, I'm going to give you the Master Resell Rights AND Giveaway Rights (Worth $67) to this software which allows you to be able to distribute it freely to your either your subscribers or your prospects. * Sell this complete software package (complete sales page included) for a low price and watch as the sales come pouring in to your Paypal account..
* Include it as a bonus for your own products and instantly increase the conversion rate (which mean you make more money)..
* Include it as a bonus on your membership site and give your customers a reason to stay even longer as paying members..
* Use it as a bait for One-Time Offers by allowing your visitors to download them for free, and then sell them something else as a "one-time" or "backend" offer..
* Give it away for FREE on your website as an ethical bribe to get people to subscribe to your mailing list.. Secure your copy of Warrior Tools Version 1 package now at the lowest possible price of just $7.00 - that's less than what you paid for lunch! You'll get five effective and easy-to-use software, with complete sales kit and instruction files, as well as Master Resell Rights + Giveaway Rights - it's just too good to refuse.